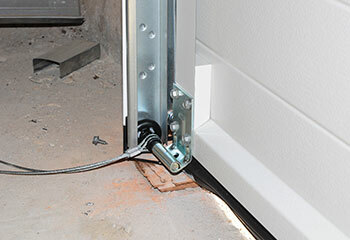 If you need some help finding the right garage door for your home, or if you already have an automatic system and you need to have a broken spring or a damaged panel replaced, our team can help. Here are a few of our latest projects. 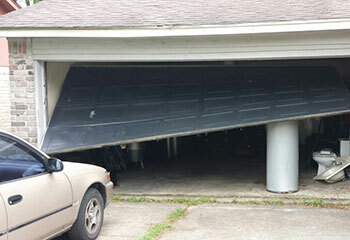 Customer Issue: Our customer’s garage door had gotten dislodged from the track. Our Solution: After determining the precise spot where the door had come off of the track, our professionals carefully pried it open. The door’s rollers were then carefully shifted back into it before closing the track back up. The system was tested to assure full functionality as well. Customer Issue: Rollers wore out. 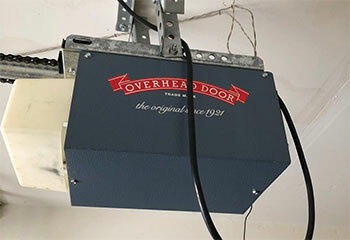 Our Solution: We took the door out of its tracks, removed the damaged rollers and fitted new units in their place. We then proceeded to lubricate the new parts, as well as the hinges and torsion spring, and then opened and closed the door several times to ensure the lubricant was evenly distributed. Customer Issue: The trolley carriage was moving but the door wasn’t opening. Our Solution: We determined that the problem was a broken trolley. We carefully slid it off the chain and replaced it with a new one, but not before first attaching the chain to the rail to help maintain its location on the sprocket. Customer Issue: Remote not working. Our Solution: We examined the remote and determined that it was in perfect order, apart from not being able to control the door, that is. 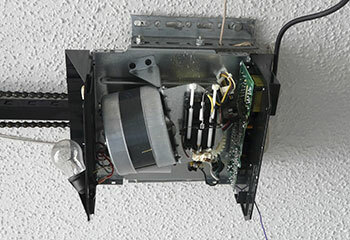 We opened the housing of the opener's main unit, removed the circuit board and replaced it with a new one of the same exact model to ensure full compatibility. We cleaned the motor and placed the cover back on. We then reprogrammed the old remote, and tried it. The door opened without a hitch.